Looking for a dessert for an event that every guest will love? Bring an authentic Italian Ice Cream shop to your next party! 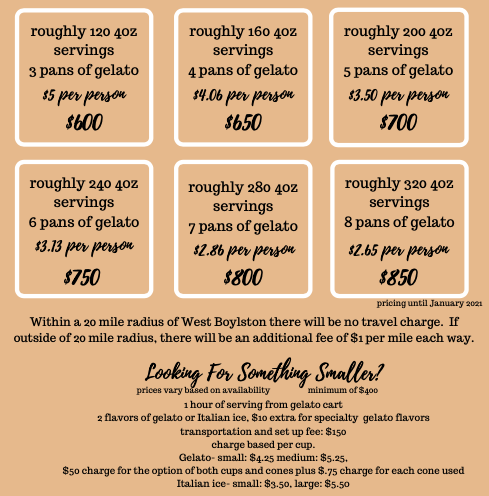 Iovanni’s Gelato currently offers catering for any occasion! We can cater your next event, including bar mitzvahs, weddings, corporate events, etc. All you have to do is pick the flavors and we’ll do the rest! For catering, our display case holds five different flavors at one time of either gelato and/or sorbetto. All gelato and sorbetto flavors are made from scratch just for you, using our house recipes and all-natural fresh ingredients. Many dairy-free and gluten-free options are available for your guests. Packages include; full service by our catering team, flavors of your choice, cups, spoons, napkins, and complete set-up and takedown of all equipment. Wholesale for businesses is also offered. plus set-up, 2 hours of serving from gelato cart, clean-up, and we will pint and leave you with any remaining gelato leftover after event. If you need us longer, no problem! It’s just $60 per hour extra if you need us longer than the time allotted for each package.